During our recent discussions around our official Co-Op Terminology guidelines for Co-optimus.com, we went over a lot of what we'd like to see in games. Over at The Escapist forums they had a similar discussion at about the same time. 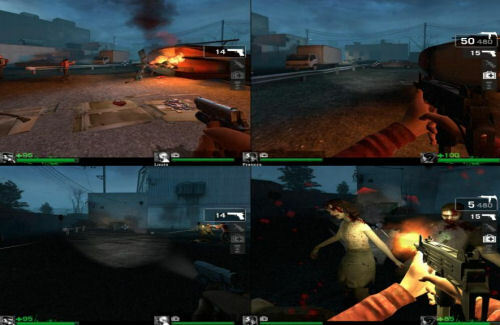 Most of us demanded splitscreen with online capabilities, while Escapist readers were asking "Where did the 4 player splitscreen go?" "This is something that's really been grinding my gears, so to speak. I've noticed fewer games are being released with 4 player offline co op. While online is fun, and you have a bigger screen, it NEVER compares to chilling on a couch with 3 other buddies, covering each other's back, eating junk food, etc. There's plenty of 2 player still around, but seeing as I only rarely hang out with less than 3 other people, this is a problem. Do any of you agree with this? For the sake of discussion, why do you think this has happened? Or do you totally disagree with me and think that 4 player offline co op is a-boomin'?" 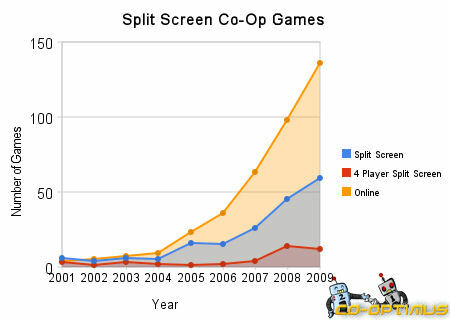 It seems as though we've traded splitscreen co-op for online co-op over the years, wouldn't you agree? So why is there a decline in split screen co-op, and more specifically 4 player split screen? Conspiracy theorists say it's so gamers are forced to buy more $60 games, and therefore line the pockets of publishers and developers with more cash. The reality is that game development has become increasingly difficult, with team sizes often in the hundreds. 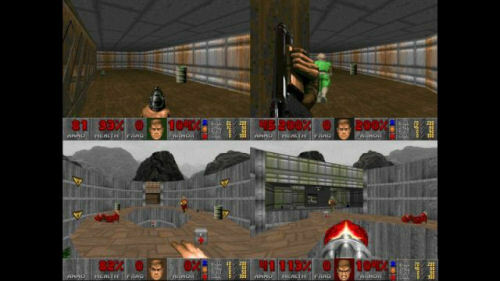 The recent DOOM release on XBLA offered 4 player split screen. Most games do their best to squeeze every ounce of juice out of a console, and when developers are optimizing their game, they do that for a single screen. Unless an engine is already built to be easily scalable, extra work goes into creating the 2nd, 3rd and 4th screens - with each iteration of those being optimized through dozens of levels for play. This involves textures, models, UI and other assets being checked and possibly reworked. There is a onetime cost to implementing split-screen technically, and from there the problem becomes one of frame-rate optimization. There are systems in the game that are being run twice as often as they were before you turn on split screen, so a bunch of the work is to make these systems run faster than they did before. As you can see, it's not as cut and dry as most gamers had hoped. And if you look at the trend of cooperative games over time, 4 player split screen games pretty much keep the pace with what's relative out there. So, is 4 player co-op split screen gaming on the decline? Perhaps a bit. What once was common to us in games like Perfect Dark and Goldeneye, may be a feature we only see in the most polished of titles like Halo 3: ODST, Ghost Recon and others now that online co-op has taken precedence. It also brings up another popular feature - Split Screen with Online Co-Op, basically allowing two separate pair of players to play together over the internet, each with their own split screen. Perhaps this is the concession of 4 player split screen? As co-op gamers ourselves, we'd like to hear what you have to say. Is 4 player co-op a dying art, or do we just need to demand to see more of it? Or, do we want to see a focus on perfecting online co-op? Developers often have to make a choice, and we ask you to do the same. Tell us your preference, or your personal theories on which is better for co-op gaming. Do you want more split screen or more online?